To be honest, I almost didn't take the SOL Challenge this year. I know this is a trope, but there is a lot on my plate. Maintaining my personal blog even weekly has been challenging. However, at the eleventh hour, I found myself filling out that participation form and drafting my first post of March. Tara Smith's post on the second day describes the connections she feels to her daughter because of books. "At lunch time, feeling the need to connect with her somehow, I reached for one of her favorite Harry Potter books," Tara wrote. Yes, books connect us, and so does writing. Throughout the day, I check in on comments, and I'm always happy to see comments from the people I have met through the writing community checking in and leaving a message. I'm also happy to meet new people through their comments and through the posts where I head to read and see what they are writing. And also, just as Tara connects with her daughter through books, I connect with my own daughter, Larkin, because this is her third year doing the Slice of Life. Larkin is away at school, and even though I talk to her a couple times a week (sometimes more, sometimes less), reading her posts throughout March and seeing what she celebrates and highlights through her writing each day is an unbelievably powerful connection. It's one thing to put up pictures, which all of my daughters do, but it's another thing to take the time to reflect and write about them. Writing is something we value as a family. Even as I sit drafting right now, my youngest daughter is plunking away at her keyboard, sharing snippets of her story with me when she creates a special line or image. Maybe in another few years, she will be away at school connecting with me through the Slice of Life Challenge. This makes me proud. I am proud to be one of your friends. I am proud that you have given the love of writing to your daughters. Now I'm off to read Larkin's post. She will LOVE your comment, Margaret. Thank you for keeping the positive energy going. I always love Larkin's posts. What a literate family you have raised! My daughter is writing this time, too. In fact, she is the one who encouraged me as I was going to pass on the challenge this year. What fun to share a bond with our daughters through writing. Wow - how cool! I have never done the March challenge and too am worried how I will juggle it all. I agree I love the community and feel limited if I only respond to 3 people. I want to read everyone's post!!! I will head over to Larkin now! Be kind to yourself about commenting. Sometimes that's a bigger time commitment than the writing. Thanks for supporting Larkin! I love your reflection about how writing connects us all -- families included. Although SOLSC is quite time consuming, it is so awesome to keep up on what's happening in each other's worlds. I have met some amazing "friends" through this challenge. I enjoyed your slice very much. Thank you! I was so happy to see that Larkin was back at the March Challenge, Melanie! I think that these writing and book connections feed our familial lives and help us stay close no matter how many miles away we are from each other. 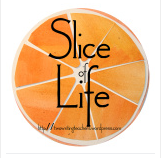 Glad you are slicing, too! So glad you joined the challenge again...love hearing what you have to say! What a wonderful connection with your daughter!